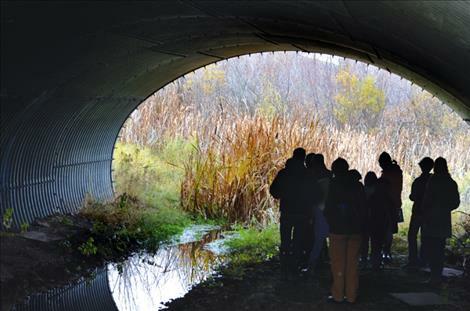 Students from Glacier Lake School investigate the animal crossing tunnel under Highway 93. 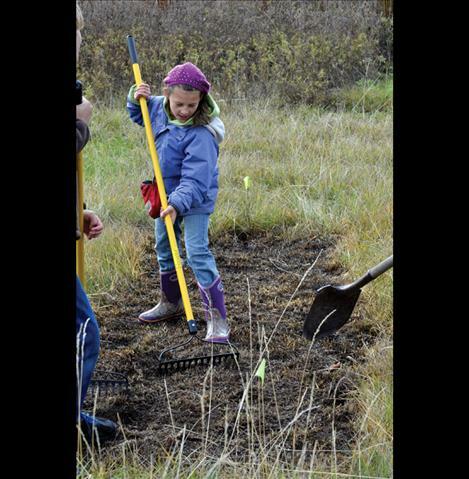 Natalie Helser, 10, works the soil to get it ready for planting. 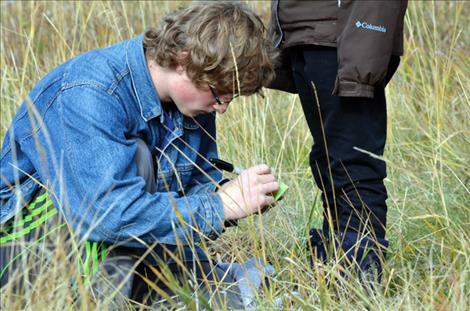 ST. IGNATIUS – Students at the Glacier Lake School, where learning is self-directed, wanted to help create habitat for wildlife, so they contacted the Confederated Salish Kootenai Tribes’ Natural Resources Department and found out that the tribe does a lot of habitat restoration. The tribe agreed to let the kids help with a portion of land they are restoring north of town where the four-lane highway turns back into two lanes. Under the highway, there is a wildlife crossing structure at the location that looks like a tunnel. Bears and other animals often quietly walk under the busy road. Tracks can be seen where deer stood to take a drink from the small stream of water trickling through the structure. An old home was removed from the site a while back along with many non-native plant species. Now, they are working on restoring native vegetation in the area to provide food and cover for those animals. The tribe bought many pieces of land about 30 years ago for a restoration project, including the section the kids were working on. Funding for the project came from a lawsuit the tribe won for damages done to land below what was then Kerr Dam. “We are out of money from the project to buy more land, but we are working on restoring the properties that we have,” CSKT Biologist Whisper Camel-Means said as she helped the students with their restoration project. 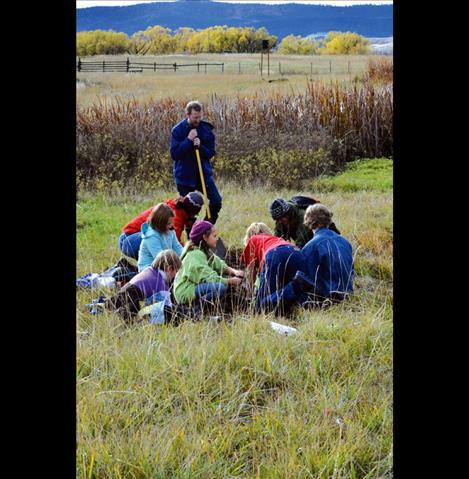 On Tuesday, Oct. 27, students gathered at one of the sites and started digging in the ground to prepare the soil for seeds. Camel-Means explained to the students that the fall season was one of the best times to plant. She said the seeds would come up in the spring in time for students to come back and observe the progress before the school’s summer break. She also explained that while restoration is a rewarding project, it can also be frustrating. She urged the students to be patient. She said native voles decided to make a meal of the root system on a group of trees she planted in the past. “We’ve been working on this property for years,” Camel-Means said, adding that help from the students was welcome. Seeds for the project were donated by Native Ideals, a small company out of Arlee that grows only native seeds. Rebecca Shoemaker is one of the two owners of the company. She helped students add packets of seeds to a sand mix used to disperse the seeds over the ground. 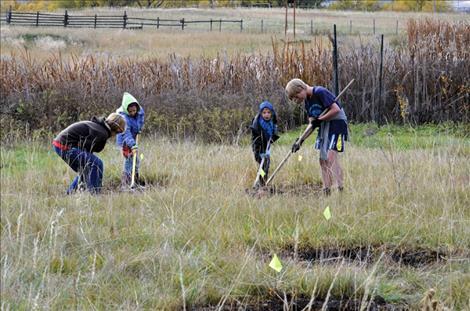 She said helping the students with their project was right in line with her company’s goal of creating a healthy plant population in Montana. The students each took a container of seeds and sprinkled them over a plot marked with numbered flags. They recorded the types of seeds planted in each plot so they can monitor the progress. 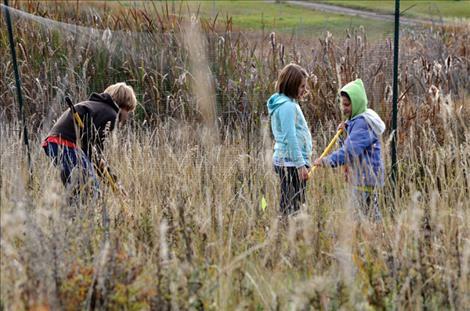 The students spent the afternoon working 21 different small sections of ground, and they hope to continue restoring the area with more field trips in the future.